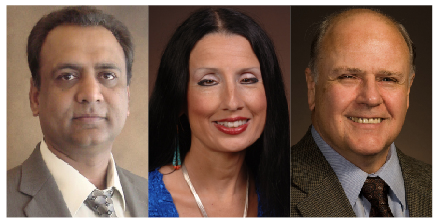 Three Arizona State University professors have been named Regents’ Professors for their extraordinary contributions in the classroom and in their fields of expertise. Regents’ Professor is the highest faculty honor awarded at ASU, conferred on faculty who have made pioneering contributions in their areas of expertise, who have achieved a sustained level of distinction, and who enjoy national and international recognition for these accomplishments. Honored with the distinction of Regents Professors in 2012 are Ron Adrian, a professor in the School for Engineering of Matter, Transport and Energy in the Ira A. Fulton Schools of Engineering; Sudhir Kumar, a foundation professor in the Biodesign Institute Center for Evolutionary Medicine & Informatics and School of Life Sciences; and Rebecca Tsosie, professor in the Sandra Day O’Connor College of Law. Adrian is a pioneer in the field of fluid mechanics, winning essentially every major award within the field. In addition to being elected to the National Academy of Engineering, he is a fellow of the America Physical Society, American Society of Mechanical Engineers and American Institute of Aeronautics and Astronautics among others. He has made major contributions to the study of turbulent flows (chaotic or unstable eddying motion in a fluid) through his groundbreaking experiments, by his development of new instrumentation for studies of turbulence, and capitalizing on the understanding gained by these measurements to advance theories and models of fluid flows. He has created advanced experimental and mathematical methods that have revealed new aspects of turbulent flow and inspired novel lines of research in the fluid mechanics community. Adrian’s research has resulted in seminal contributions to the development of diagnostics used to measure turbulent flows and to mathematical models used to understand and predict their underlying structure. Most labs today that specialize in fluid mechanics use systems based on his work. Adrian’s research has been cited more than 8,000 times and has resulted in eight patents, new technologies and many students and researchers who have benefited from his mentorship. Almost all of the 35 doctoral students mentored by Adrian have moved into prominent positions in academia, the national labs and industry. Others have used their education in turbulence to pursue interesting careers outside of engineering, including international banking and Oscar Award winning independent film production. Kumar has developed many methods and tools that are indispensable in the genomic medicine, evolutionary biology and functional genomics fields. In addition to being president of the Society for Molecular Biology and Evolution, he is an American Association for the Advancement of Science fellow. Kumar is a renowned expert in the evolutionary bioinformatics field who developed MEGA (Molecular Evolutionary Genetics Analysis), a software package that provides evolutionary analysis of gene sequences across individuals, populations and species, with colleagues Koichiro Tamura and Masatoshi Nei. The software has been downloaded more than 750,000 times and papers documenting this analysis infrastructure are among the mostly highly cited in biology and computer science literature with six papers cited more than 42,000 times. Kumar inspires the next generation of scientists through inquiry-based biology and informatics classes such as “Introduction to Comparative Genomics” that offers students a hands-on approach using real-world examples of evolutionary genomics concepts and approaches and relevant applications in biomedicine. He has mentored 17 postdoctoral associates/research scientists, many of whom have gone on to successful positions in academia or the private sector. Kumar is working on a new field of “phylomedicine” where evolutionary knowledge and powerful bioinformatics tools are used to identify the underlying genetic basis for many human diseases, providing a step toward individualized medicine. Recognition of his achievements also includes: Arizona Governor’s Celebration of Innovation finalist (twice); ASU Faculty Exemplar; and the Innovation Award in Functional Genomics. Rebecca Tsosie is one of the most highly regarded scholars of Indian law in the world, authoring more than 40 law review articles and book chapters during the past 15 years. She is co-author of the nation’s leading treatise on Indian law, “Indian Law: Native Nations and the Federal System.” Her work is widely cited and she has contributed chapters to almost every leading volume on American Indian law published since 2001. Among the many awards she has been granted include the Native Nations Distinguished Alumnus Award from the UCLA School of Law. She is a past recipient of the American Bar Association’s 2002 Spirit of Excellence award and she was honored as Professor of the Year in 2009 at the Sandra Day O’Connor College of Law. The University of Oregon awarded her its inaugural Oregon Tribes Professor of Law position. As executive director of the ASU Indian Legal Program for 15 years, Tsosie was instrumental in transforming the program into one of the nation’s best and she helped in the formation of the law schools master’s degree program in Indian Law. A graduate student mentor, she also serves on many law school and university committees and she aided in the formation of the Indian Legal Clinic that was recently awarded the President’s Award for Social Embeddedness. As a valued member of the American Indian community, she is a Supreme Court justice for the Fort McDowell Yavapai Nation and San Carlos Apache Tribe. She is also engaged in public education efforts and training Indian law attorneys.